Panmure Lagoon Sailing Club has completed yet another very successful RSA Laser Regatta with participants coming from provinces of the far North, Taipa, Onerahi, Southern territories, the Waikato, Lake Ngaroto as well as locals such as French Bay, Weymouth and Pupuke. A large fleet of lasers hit the water in moderate Easterly breezes of 8 to 12 Knots & steady, giving the valiant laser sailors some very exciting and tactical sailing to get their teeth into. The local PLSC boys did prevail on the day with Dario Motta winning not only his Standard division but for the third consecutive year, the RSA Laser Trophy for overall winner and Kevin Welsh winning the Radial division. There were some very close battles fought thoughout the day. Garth Briden, Jock Bilger with the help of Kim Ardmore kept the races turning over at great pace enabling the fleet to enjoy 5 races. This was followed by a yummy roast lamb on the spit & prize giving. Our sponsors this year have been very generous in their support of the PLSC Regatta which saw all those attending taking away spoils of the battle. Thanks goes to our sponsors for their continuous support: the RSA, CRC, PredictWind.com, Waipuna, Yeeha, Auckland Seaplanes, Voyager New Zealand Maritime Museum, Auckland Marine Centre, The Watershed, Joy Adams Sails, Sugarcrafts, Survitecgroup, Boating NZ, YMCA, Boat books, Flyajet and Coromondel Cacti. 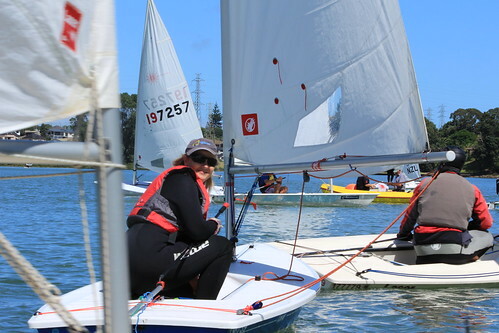 The Auckland Laser Champs at Tamaki over the weekend provided a full variety of conditions over the two days for the 25 sailors who rolled up on Saturday morning. We were fortunate to enjoy another stunning blue sky day with a great sea breeze for the final day of the National Laser Champs in Nelson. Racing again started as soon as the sea breeze filled in just after midday, with 4 races being completed for the Open divisions and 3 for Masters, meaning that all divisions were only one race short of the programmed number despite the loss of races at the beginning of the contest. The breeze steadily built through the afternoon, topping out at about 15 knots. The slightly lighter breeze, combined with the tide being later than yesterday meant there were considerably smaller waves that we had for yesterday afternoons races. However, the tide again caused some issues on the start line in the later races, with several sailors again suffering OCS’s for premature starts due to the tidal effect on the line. In the Open Andy Maloney held his lead to win convincingly from Dutch sailor Nicholas Heiner with Tom Saunders in third. Past champion Mike Bullot was fourth, followed by our other Dutch visitor, Rutger Van Schaardendurg, who ended up 5th after having to count a DNF in spite of several race wins. In the Radial leading Women’s sailor Sara Winther won overall from top youth sailors Trent Rippey and Sefton Cole. Susannah Pyatt however had a very strong day including a 1st and two 2nd’s to rise to 4th overall. Leading Women’s Youth sailor was Ali Nightingale in 9th overall. Lachy Grimwade had a great day with 3 firsts in the 4.7 to take the title from Japanese visitor and top female sailor Emily Koya. Defending champion, Apprentice Chris Decke, won a very close contest in the full rig Masters to take the title from Master Andrew Dellabarca with Apprentice Kent Copplestone sailing extremely consistently for third overall. He was followed by master Owen Anderson in 4th, with Nick Page taking the Grand Masters title and holding on to 5th overall. Bob Blakey was the leading GGM’s in 11th overall. In the Masters Radial Apprentice World Champion Scott Leith continued to dominate and took the overall title winning every race. Richard Blakey moved up to second overall , overhauling Ed Tam who held onto 3rd. Mike Keeton was the leading GM in 4th and Jim Quinn the leading GGM in 11th. Overall the contest was extremely well run by Nelson Yacht Club and delivered wonderful conditions for the final 2 days after a frustrating start. The Open and Radial fleet will now be moving to Sail Auckland, the second NZ team qualifying regatta for the season. Next years contest will be at Takapuna Boating Club in January 2015 and we look forward to a large fleet and more high quality racing. Results after the final day. Many thanks to the wonderful volunteers at the Nelson Yacht Club. Great sailing the last 2 days. Very forendly and well organised. Awesome lunches. And Tasman Bay scenary people travel around the world to see. Results for the 2013 South Island Laser Champs. Sailed at Nelson Yacht CLub on the 14th and 15th December 2013. A wonderful 2013 Laser North Islands Champs sailed for the second year in succession as part of Napier Sailing Clubs Hawkes Bay Summer Regatta. Thanks again to the Napier SC staff and volunteers who were as friendly and professional as always. Of course Hawkes Bay turned on trademark warm and sunny conditions. Sailing conditions varied from very light 7 knot to medium 12 knot ENE on Saturday. And medium 10 knot to 15 knot NE on Sunday - with good waves building in the afternoon. The Lasers shared the outer course with OK's, which we can at least comprehend, and the the 12 foot Skiffs and Javelins - which come from crazy angles at high speeds with spears attached to their bows. The results show who does best in the different wind speeds. Local Michael Cressey was clear ahead on the first light day in the Radials before slipping behind Matt Kempkers and Keith Inglis on the stronger second day. Kent Copplestone dominated the standards, with a very tight battle for second between Peter Kempkers and Greg Wilshire who got his act together on the Sunday. The first Auckland Masters regatta of the season, the North Harbour Masters, was held at Pupuke on Sunday. A strong turnout of 27 boats enjoyed a challenging days sailing, with a 8 – 12 knot shifty southerly providing opportunities for all. The conditions prompted several sailors who normally sail Radials to step up to full rig for the day, including World Radial Apprentice champion Scott Leith who ended up a convincing winner of the 5 race series after an unfortunate course error in the last race cost Whangarei visitor Kris Decke a share of the points lead. It was great to see a strong Masters fleet turning out at this stage of the season. Several were using this as a warm up for the Masters Worlds in Oman next month and many in the fleet will be heading to the North Islands in Napier on the weekend of 23/24 November and to the Nationals in Nelson (16 to 19 January), which is looking to have a strong masters turnout. The carpark was bursting and the racing tight at the 2103 Auckland Laser Masters Champs at Tamaki on the Saturday 20th April. We were pleased the boys from Onerahi YC in Whanagarei made the drive South again. They bolstered the contingent from Lake Pupuke, Wakatere and Panmure. As always Ken Atchison came up from Hamilton. Richard Blakey has seen the error of his ways and returned to the Laser after a 4 year break. And Murray Thom came out for the first time in a while. Both proved they haven't gone stale. Thanks to all the competitors for making it the strongest Auckland Masters for a few years. The light forecast drew some sailors over to the 29 boat Standard fleet at the expense of the Radials with 8. We were also joined by some Phase 2s having their championship event. The northerly conditions and Tamaki's signature lumpy seaway provided a perfect mixture of challenges. Good shifts exposed tactical options. It was lightish for 3 races and quite breezy for 2, with 17+ knots brought in by menacing rain fronts. Race officer Garth placed us in our standard spot just off the club south of the shipping lane and nicely clear of Rangitoto. He mixed 2 triangle + windward-leeward races and 3 straight windward-leewards. The windward-leewards seemed more popular. Both fleets were quite compressed and very competitive. 2 general recalls for the first Standard race was a sign of the attitude. Mark roundings were particularly busy. It was rare to get a comfortable gap to the boats behind on the runs rewarding good downwind technique in the waves. One radial race finished with a 4 way tussle for second that could have gone any way. Scott Leith stood out in the Standard, dropping one 5th to net 4 bullets. Scott is training for the Open Radial Worlds in Ireland in September. Kris Decke pipped Murray Thom for second in a closer points tussle netting 10 and 12. All 3 leaders were close on the water. The Radials had a real battle for top spot. Tom Speed and Roger Winton ended up tied with identical total 11 and net 7. But Tom won on count back with 3 wins to Rogers 2. Jim Quinn was 3rd. At the prize giving Bob Blakey pointed out 74yo Tom was the Auckland Masters oldest ever winner. Although Tom is generally more interested in being the winner and less interested in the age. Thanks again to Garth Briden and his race team and Tony Beckett and his volunteers for putting on a great regatta. The RSA Regatta saw our car park fill rapidly with boats & hawkish competitors ready to mount their steeds for a jolly good day’s battle on the race track. We had sailors coming all the way from Melbourne, Taipa, Lake Ngaroto and many Clubs around Auckland. Weather started with 4 to 6 knots & rain which cleared to fine & winds up to 12 Knots & variable direction which laid down the gauntlet to the sailors. Nearly 50 Lasers hit the start line only to learn that sailing on the Lagoon is for the smart, the brave & the quick as like always the Lagoon had some very tricky winds to negotiate leaving the unweary floundering at the back of the fleet. After racing was completed the club put on a fantastic BBQ with lamb on the spit which was soon turned to bare bones as hungry competitors refuelled. Prize giving followed with the top sailors collecting some fantastic prizes & those who were not quite so lucky in their sailing fortunes participating in a spot draw which saw all sailors come away with a prize thanks to your generosity. Against stiff opposition PLSC’s Dario Motta won the open standard, PLSC Kevin Welsh 1st Radial, PLSC Amy Linford 1st women, PLSC Andrew Coffin 1st Junior. This was all made possible with your very generous sponsorship of our event: Waipuna Hotel and Conference Centre, the Water Shed, Survitec Group, Boat Books, Laser NZ Direct, Boating NZ, Coromandel Cacti, Sugarcraft, Yeehah Fishing Tackle, Joy Adams Sails, Seaspray and Predict Wind. The 2013 Auckland Laser Champs were held at Tamaki on 23rrd & 24th of February. Many thanks to Garth and the team for getting all 6 races in the sometimes light and fickle conditions on the other side of the reef between Kohimarama and Rangitoto. Jack Collinson, George Lane and Kris Decke lead the Standard fleet. Andrew McKenzie, Scott Leith and Sara Winther lead the Radials.